“Along the Distant Mesa” at Mark Sublette's Medicine Man Gallery in Tucson is an homage to Manynard Dixon through the eyes of the finest artists working today. 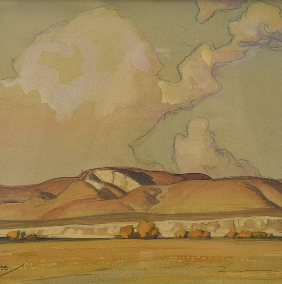 Works by 40 nationally and internationally recognized artists influenced by Dixon will be exhibited March 7 through April 30th. The show is unique as the contemporary artwork will be hung next to Maynard Dixon drawings, illustrations and oil paintings, over 40 Dixons will also be for sale. “Maynard Dixon’s American West: Along the Distant Mesa” the show’s accompanying hardback book, is now available for purchase. Maynard Dixon (1875-1946) - Gallup N.M.
x SOLD Maynard Dixon (1875-1946) - Outlines of the West: Quien Viene? x SOLD Maynard Dixon (1875-1946) - Outlines of the West: So Long, Pardner!